Thallus: endosubstratal or very thin, episubstratal parts continuous or rimose surface: pale gray, often with a greenish hue, dull, esorediate cortex: poorly developed, 5-15(-20) µm thick medulla: mostly lacking; algal layer: 35-50 µm thick Apothecia: rounded to somewhat deformed, rarely tuberculate, sessile with a constricted base, 0.25-0.75(-1.05) mm wide disc: ochre to reddish brown, sometimes in parts grayish brown or almost black, plane or weakly convex margin: same color as disc or slightly lighter, hardly prominent and soon excluded or lacking from the beginning exciple: hyaline within, often pale brown or yellow at the outer edge or near the hymenium, laterally 25-60 µm wide, basally 35-85 µm wide, composed of radiating hyphae with 0.7-1 µm wide cell lumina and apical cells of 2-5.5 µm in diam. epihymenium: reddish or olive brown, sometimes very pale or in parts hyaline, composed of pigmented paraphysal tips, 5-10 µm high hymenium: hyaline to pale yellowish brown, 35-55 µm tall; paraphyses: basally hyaline, with lumina 0.7-1 µm wide and apically mostly brown with lumina 2.5-6 µm wide, weakly branched and anastomosing subhymenium: hyaline, 30-85 µm thick hypothecium: hyaline or pale brown, 45-125(-170) µm thick asci: clavate, ±Bacidia-type with an I+ blue tholus containing an indistinct, lighter blue, tapering axial body, 8-spored ascospores: hyaline, simple, fusiform, (7-)8.6-11.5(-13.5) x (3-)3.5-3.7(-4) µm Pycnidia: not seen Spot tests: thallus K-, C-, KC-, P-, UV- Secondary metabolites: none detected by TLC. Substrate and ecology: on smooth bark of deciduous trees and shrubs, including Heteromeles arbutifolia, Quercus, Ribes, Rhus diversiloba, and Umbellularia californica World distribution: North America and Europe Sonoran distribution: southern California (Santa Monica Range and Catalina Island). Notes: Lecidea erythrophaea is distinguished from other Sonoran species of Lecidea s. lat. by its pale apothecia and fusiform spores. 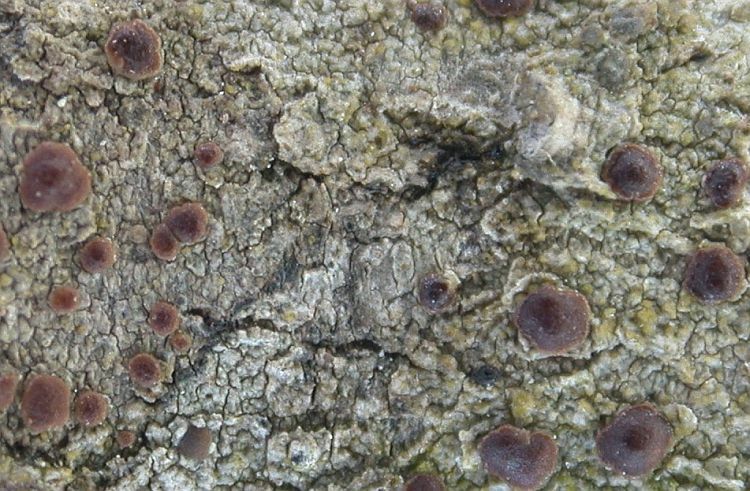 Lecidea exigua has much smaller, often has slightly pruinose apothecia, a Lecidella-type ascus, and broadly ellipsoid spores, while L. nylanderi has marginate apothecia and globose spores. European material of L. erythrophaea has slightly larger spores, but otherwise is very similar anatomically and morphologically. Whether the Californian specimens represent a distinct species might be difficult to establish, as the last known collection dates from 1915. The species may be extinct within the area.